Viewfinder: The Look of "Harold and the Purple Crayon"
Recently, I took my kindergartener to see the Children’s Theatre Company’s colorful, musical theater production of Harold and the Purple Crayon. Their adaptation of Crockett Johnson’s classic children’s series from the 1950s is so charming, so sweetly upbeat and whimsical — it made my teeth hurt. My son, a fan of both the books and the Scholastic video version of the stories, was instantly and utterly rapt. But it’s more than just a good show. What really struck me was that our experience of the story, from page to stage, was almost seamless. From the moment the lights went down and Harold grabbed his crayon, we believed. When you get right down to it, there’s little actual plot to keep track of – Harold’s imaginary adventures are more dream than story. In this staging, there’s lots of hammy singing and dancing, and the kids seemed to love that. But truth be told, though they were well executed, the show’s tunes didn’t seem to me all that memorable (although my son was very impressed with the appearance of a disco ball during one number). Photos by Dan Norman, courtesy of the Children's Theatre Company. It’s the look of the production that made the magic: the pitch perfect set and costume details, the visual surprise and ingenuity of the puppetry, lighting and use of animation. It’s the design of the show that’s left me marveling. Harold’s got his blue-blue footie pajamas and oversized magic crayon, of course; his two supporting cast members are likewise dressed in comfortable-looking rompers. The accompanying props and set designs for each scene are minimalist and gorgeous: there’s a puffer fish puppet as delicate as origami; an elegant, stylized Asiatic dragon; a ginormous, menacing crab pincer; furry space aliens; inexplicably and delightfully Francophone critters hungry for pie. Harold’s sailboat and rocket ship, in particular, are wonderfully faithful to the original drawings. 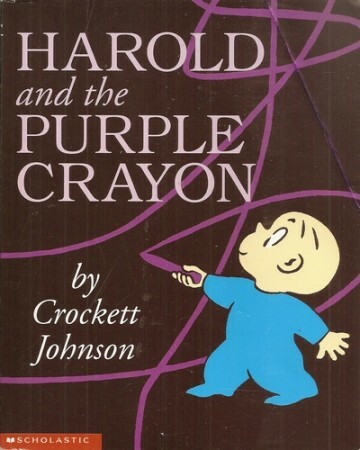 And all of it is set against a backdrop of evocative computer animation and lighting effects, which shift – from mountaintop to undersea to outer space –following where Harold’s crayon and rich imagination take us. The show is filled to the brim with both low- and high-tech hacks used to conjure these beautiful dreamscapes, with a minimum of fixtures and lots of multipurpose, movable pieces: the effect is by turns trippy and fanciful, equally well suited to invoking the vast expanses of space or Harold’s cozy bedroom. The world created on stage is all-enveloping and enchanting. 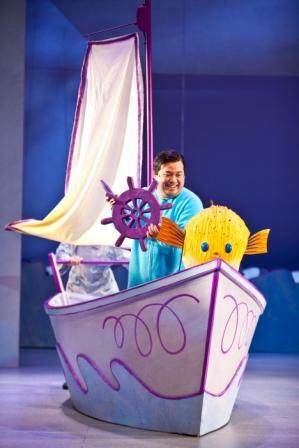 Harold and the Purple Crayon closes February 26 — if you haven’t yet seen it, grab a kid and go. About the author: Susannah Schouweiler is editor of mnartists.org.